You’re the captain of a Federation starship, ready to seek out new life and new adventures. As you travel through the galaxy, how do you know where you are? How do you find your way home? On Earth, your position is given by latitude and longitude. They are measured in angles about the center of the Earth, where latitude is the angle north or south of the equator, and longitude is the angle east or west of the Prime Meridian, which runs through Greenwich, England. It’s fairly easy to determine your latitude, particularly in the Northern Hemisphere. Since the north star Polaris is almost directly above the North Pole, you can simply measure the angle of Polaris above the horizon, and that’s your latitude. You can also use a sextant to measure the altitude of the Sun above the horizon at noon, and calculate your latitude from that. Longitude is much more difficult. Since stars rise and set over the course of a night and the night sky shifts over the course of a year, there isn’t a fixed reference point against which you can measure longitude. Instead, early navigators either had to compare the shift of stars with measured distances between cities. It wasn’t particularly accurate, and you can see that in early maps of Europe. Things got easier when Galileo discovered the moons of Jupiter. Their clockwork motion could be used as a celestial clock, and by comparing their motion to the rotation of the Earth cartographers finally had an accurate tool for measuring longitude. Unfortunately, this method wasn’t useful at sea, so it took the development of accurate clocks to bring accurate longitude to sea-faring vessels. Nowadays we can simply use the global positioning system (GPS). The GPS consists of more than 30 satellites that continually transmit their location and time. By picking up the signal of at least four of these satellites, your phone can triangulate your position on Earth. 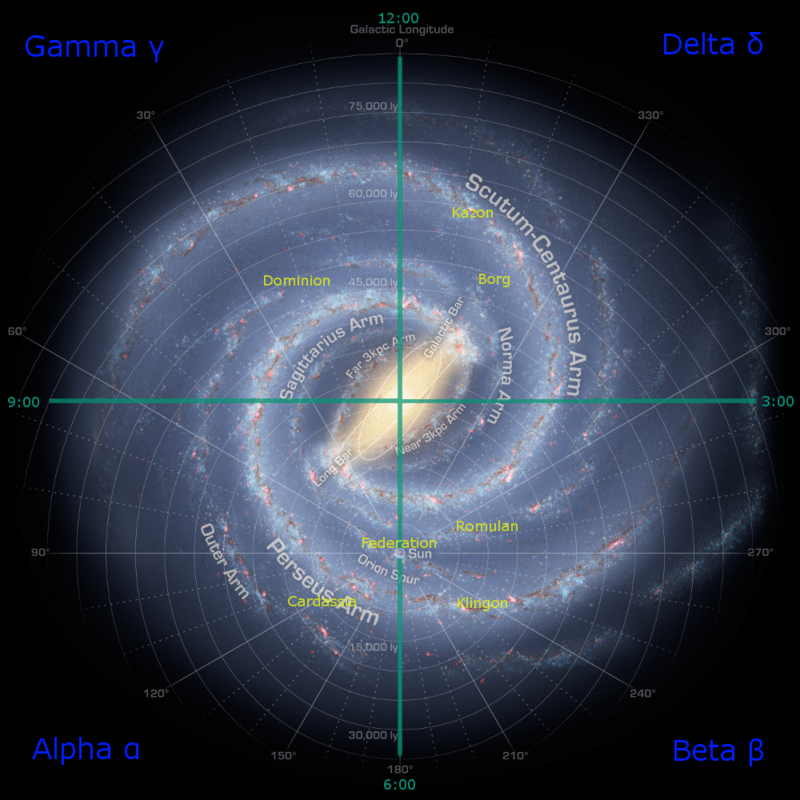 Defining your position in the Milky Way can be done with galactic latitude and longitude. Simply define a galactic equator and a prime meridian, and determine your position relative to them. For galactic coordinates astronomers define the galactic equator (0° longitude) as the plane of the Milky Way running through its center. The prime meridian (0° latitude) is defined by a line running from the Sun to galactic center. In astronomy the sky can be treated as a celestial sphere, so the apparent position of a star can be given by its galactic coordinates. Your position in the galaxy could thus be given by three numbers: your galactic latitude, galactic longitude, and your distance from the Sun. The Star Trek universe is a bit fuzzy on the subject of galactic navigation, and there isn’t a definitively canon version. 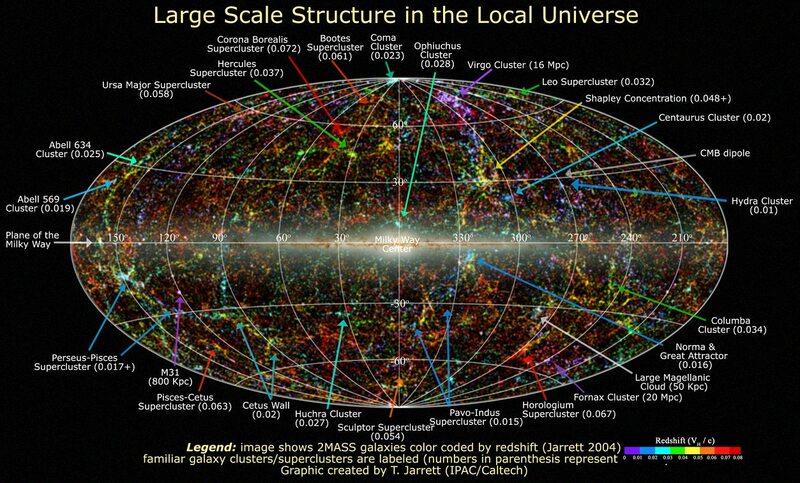 The most popular version is based upon the galactic coordinates astronomers use, with some slight differences. The prime meridian is still a line running from the Sun to galactic center, but rather than simply using galactic latitude and longitude, the Milky Way is divided into quadrants. Under this definition the Sun would lie on the line dividing the Alpha and Beta quadrant, and the Earth would cross between these two quadrants as it orbits the Sun. In the Next Generation episode “Relics” it is stated that Earth is in the Alpha quadrant, and is less than 90 light years from the Beta quadrant. That probably means the Alpha quadrant is extended around the Sun to put our local cluster of stars within the Alpha quadrant. We’ve done a similar thing with the international date line on Earth to ensure that countries aren’t divided by it. Star Trek galactic quadrants based upon astronomical coordinates. Credit: NASA, with annotations. Of course a coordinate system is only useful if you can determine what your coordinates are. 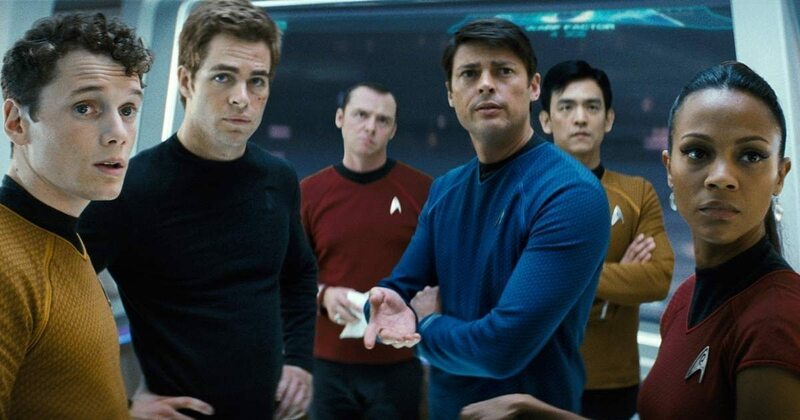 Star Trek is again fuzzy on just how starships find their way. It’s possible that they calculate their position based upon some kind of stellar map, but identifying particular stars seems a bit impractical. It turns out there is an effective way to determine your position in the galaxy, and it’s one we’ve actually used. It’s basically a galactic GPS. Neutron stars are dense old stars with strong magnetic fields. As a result beams of radio energy stream from their magnetic poles. As a neutron star rotates, those beams sweep across the sky like a lighthouse, and if their beams happen to point in our direction we see them as pulsing radio objects known as pulsars. The plaque carried by Pioneer 10 gave the position of the Sun as reckoned by 14 pulsars. The radio pulse pattern of each pulsar is unique, and we know there positions in the galaxy quite well. If your starship can detect enough known pulsars, you can use that information to calculate your position in the galaxy. So if the Enterprise drops out of warp unexpectedly, or if Q sends it to a strange part of the galaxy, the navigators just need to look for pulsars to find their way home. What’s interesting is that a neutron star’s rotation slows down over time, so older pulsars pulse more slowly than younger ones. This means you can use pulsars not only to determine your position in the galaxy, but also your stardate. It’s a useful trick when your plot of the week involves time travel. This method has actually been used. Not to determine the position of a starship, but to give alien civilizations the location of our solar system. When Pioneer 10 was launched in 1972 it carried with it a plaque indicating 14 pulsar signals. 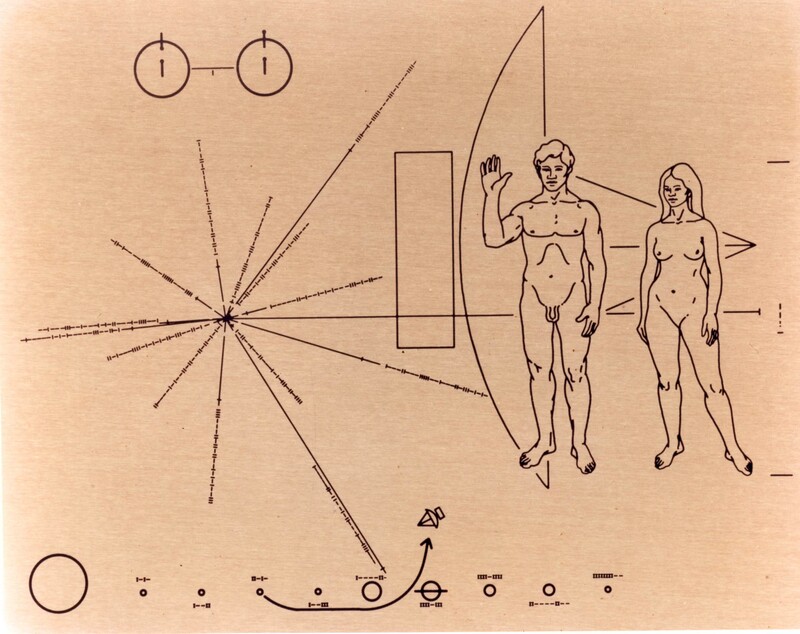 The idea was that if an alien civilization were to come across Pioneer 10 as it traveled beyond the solar system, they would be able to determine just when and from where it was launched. When it comes to the Star Trek universe, we still have to develop warp technology and subspace communication, discover wormholes, travel back in time to save the whales, and make contact with alien civilizations, but we already have a map to find our way.